Hire Adam Devine for a Corporate Event or Performance Booking. Adam Devines launch into stardom came from Comedy Centrals original series Workaholics, but Devine had been edging toward stardom for years prior to its premier. Along with friends and future Workaholics co-stars Blake Anderson, Anders Holm, and Kyle Newacheck, Devine created the Mail Order Comedy sketch-comedy group. Though they started out as a touring group, they soon found more success thru online venues like YouTube and Myspace. Their video-skit Wizards Never Die was featured on G4s Attack of the Show! In the years leading up to Workaholics, Devine held small roles in Mamas Boy, National Lampoons The Legend of Awesomest Maximus, Samantha Who and Traffic Light. His bit parts evolved into star-powered cameos once Comedy Central put him on the map and he held supporting roles in Community, Arrested Development, Uncle Grandpa, Modern Family, and most notably as the obnoxiously confident Bumper in Pitch Perfect and Pitch Perfect 2. Devine has also been the host, creator, writer, and executive producer of the short lived Comedy Central comedy series, Adam Devines House Party. In recent years Devine has upped his game with roles in movies like Mike and Dave Need Wedding Dates, The Intern across from Anne Hathaway and Robert De Niro, Why Him, and most recently in Isnt It Romantic. Devine has also done some voice acting for shows and films such as American Dad!, Penn Zero: Part-Time Hero, The Lego Batman Movie, and Uncle Grandpa.. Learn how to hire Adam Devine or research availability and pricing for booking Adam Devine to perform at a corporate event, fundraiser, private party, social media campaign, fair or festival, tradeshow or conference, endorsement project, or hire Adam Devine as a guest speaker, please submit the form to our agency. Frequently Asked Questions about booking Adam Devine. Is Adam Devine available to work my event? Adam Devine's current work schedule and location in relation to your event's type, date, budget, and locality will play a primary factor in the acceptance of booking Adam Devine for your party. As long as your funding is commensurate to the price range to book Adam Devine, CTI will propose your event to the official agency representing Adam Devine. After we consult with them, we can circle back with you to provide a personal and accurate quote that includes: final costs, availability, and actual interest in being hired for your specific event or party. How much is Adam Devine charging for events? CTI can give you the Adam Devine booking price once we submit your event details to their camp. "How much does it cost to book Adam Devine for an event?" is a frequent question we get, but the final Adam Devine booking price is contingent on many variables and the booking fee we show is based on a range derived from our past experience with what will Adam Devine charge for an event. Also, thier speaking fee might be different than the fee shown for the cost to perform or to just appear. Popularity, career stage, along with current demand will cause fluctuations in their speaking price too. The final booking price may be more than what is shown, but you should at least have a budget within that range for them to consider an appearance, performance or speaking engagement. How do I contact the Adam Devine agent or manager? CTI negotiates on behalf of professional event planners and talent buyers for paid appearances! We cannot give out direct contact information of the Adam Devine agent or help distribute fan mail, personal messages, gifts, requests for free appearances, or donations of time. The Adam Devine manager and agent will only work with us if we present them with funded offers for their client to work your event. Can I book Adam Devine for an event at a price less than shown? There is low probability to book Adam Devine for a party with anything substantially less than the published booking cost price range. We will negotiate with the Adam Devine agent on your behalf, but if your funding is not in place then it will more difficult to book Adam Devine, because they get many offers to work events that are at or above asking price. It is also important to consider the travel costs when researching the Adam Devine booking fee, as additional expenses like this, as well as an entourage of staff and equipment, are not necessarily built-in to the booking fee range shown. If your budget does not factor that in, then there is no benefit for them to want to be hired. We do not personally speak for Adam Devine, but in our experience in booking talent for over 25 years, this is generally the outcome of inadequate funding. CALL US TODAY (760) 729-2000 and speak with a CTI Adam Devine booking agent to get direct availability and pricing for having this talent to work your event. With almost 30 years of industry experience working with professional event planners and talent buyers like you, we can successfully work to hire Adam Devine for a corporate event, personal appearance, corporate entertainment, speaking engagement, endorsement, private party, or wedding. For complete information on booking Adam Devine for projects like branding and promotional marketing, product or service launches, print advertising campaigns, media events, fundraisers, social marketing campaigns, and a guest appearance on TV/Movie specials including, documentaries, infomercials or voice over in video games, please call us at (760) 729-2000. CTI will contact the Adam Devine agent, manager or representative on your behalf to inquire about the current Adam Devine booking fee and availability, while negotiating the lowest cost on your behalf. Choose CTI as your booking agency for Adam Devine to hire at corporate events, conventions, trade shows, business retreats or for television and radio commercials, voice overs, and charity events. Be advised that the Adam Devine booking price may drastically change based where spokesperson campaigns, speeches, fairs and festivals; and even a shoutout, birthday party, or private concert is located when factoring domestic or international travel. CTI agency will help book Adam Devine if the buyer has the budget and if they are interested in the event. 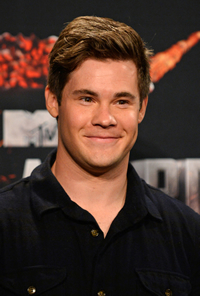 CTI can also assist on the production requirements for Adam Devine, when needed.